Google has launched 'News Timeline' and 'Similar Images' within its Labs, bringing greater functionality to its search. News Timeline, as you may have expected, is a web based method of organising search results chronologically. Users can look through Wikipedia events, Google News entries and Time magazine articles going back to the Second World War. It's far from a perfect system yet – with people's misdating of articles meaning there is a comparison of the Nokia N96 and N95 from the 1980s, but it's a laudable project that will presumably become increasingly useful. Similar Images allows you to search Google Images and then pick out a photo or picture and search for similar versions of that image. 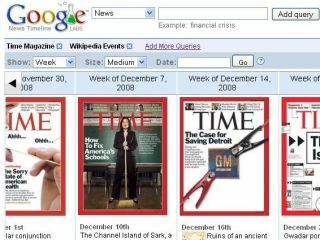 "Google News Timeline is a web application that organises search results chronologically," says the about page. "It allows users to view news and other data sources on a browsable, graphical timeline. "Available data sources include recent and historical news, scanned newspapers and magazines, blog posts, sports scores, and information about various types of media, like music albums and movies." Again, being an early Labs project, it's far from perfect but potentially a very useful tool.